We are aware the list of mobs that drop this is currently small. there were issues and we are in the process of re-populating the list. This also drops off of Galvanized Guardian in Ashengate. how exactly is a large powersource used to make the required item for the terranx task? You make the armor first, then the powersource is used to add the focus effect and mods like shielding. Just like the tier 1 armor. The large versions are for the TSS raid armors in quests from Terraxs in Crescent Reach. They have nothing to do with Tenish and the groupable armor quests. You have to get a raid-instance drop to go with a large powersource of the correct version for your class to do the raid-level armors. What do the stats on tier 3 armor look like? Is this for tier 3 armor and has anyone compleated or know how to upgrade? I received one for my sham but don't know how to use. 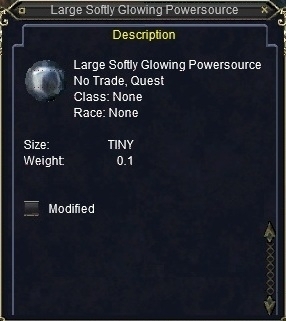 Core of Flame in Ashengate also drops "A Large Softly Glowing Powersource"
Can drop from any named?